Summer Recess: No More Lunch? 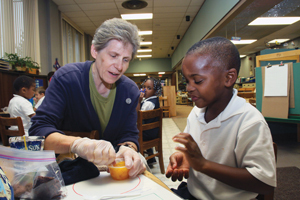 A drop-off in the reach of U.S. summer nutrition programs in 2010 and ongoing budget-cutting at state and local levels suggest that many schoolchildren in the United States will face another summer of hunger this year. According to a new report from the Food Research and Action Center, despite record numbers of children receiving free and reduced-price meals during the 2009-10 school year, participation in federal summer nutrition programs fell nationally in 2010. FRAC reports that in July 2010 only 15 children received nutrition aid for every 100 low-income students who received lunch during the 2009-10 school year. According to FRAC, budget cuts in many states caused school districts to eliminate or reduce their summer programs. Fourteen states served less than one-tenth of their low-income children through summer nutrition programs in 2010; five states—Oklahoma, Mississippi, Kansas, Colorado and Louisiana—served fewer than 1 in 15. The summer programs extend food aid to eligible children when they are out of school at participating sites at schools, parks and public and nonprofit agencies. During the school year, the U.S. Department of Agriculture reports serving as many as 21 million children. But according to the FRAC report, titled Hunger Doesn’t Take a Vacation, summer nutrition programs reached just 2.8 million children on an average day in July 2010. That continues a three-year decline despite broad evidence that hunger is increasing as a mostly jobless recovery persists nationwide. The center suggests that summer programs would benefit from better publicity and better follow-through among school administrators as they plan their summer school sessions. According to FRAC, millions in federal aid to support nutrition programs over the summer is left on the table by some states. This article also appeared in print, under the headline "Summer Recess: No More Lunch?," in the June 20, 2011 issue.